Our caveman ancestors followed a diet full of fresh fruits and vegetables, nuts, and legumes, but with time and the advent of agriculture, our diets changed drastically to include grains, dairy products, salt, and large quantities of meat. These new foods altered the level of acid in our diets, disrupting our ideal pH balance and increasing the loss of essential minerals, making us more prone to illness. This easy-to-follow guide shows you how a simple change in diet to restore your body's crucial pH balance can help you lose weight, combat aging, and keep you healthy! Acid Alkaline Diet For Dummies covers the gamut of this healthy lifestyle choice, from the symptoms of a high acid diet to the food you should have on hand to implement an acid alkaline diet—and everything in between. 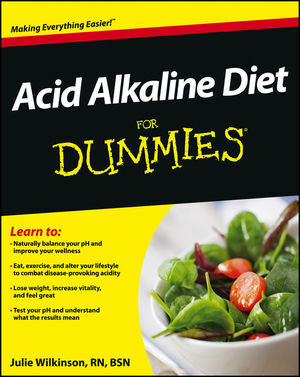 Acid Alkaline Diet For Dummies is essential reading for the millions of people with health problems interested in combating illness with a holistic, successful lifestyle change. A patient advocate and active registered nurse, Julie Wilkinson RN, BSN has achieved multiple commendations during her career, including the Meritorious Achievement Medal for Civilian Service from the Department of Defense. She is the Guide to Colon Cancer on About.com and writes for many healthcare publications as a freelancer, including LiveSTRONG.com.